Here's the home page of our class website. The navigation buttons and menus appears at the top. Here you will see the homework that is updated weekly. Click each image for a larger view. Within this area, you will see announcements that are typically updated on a weekly basis. Follow the curricula link to learn more about what will be covered in the school year. The curricula page for Social Studies. Note online book access. Downloadable study guides as well. 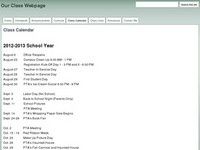 Classroom calendar overview that contains dates for school and class events. 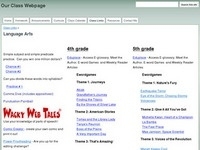 Landing page for classroom links organized by subject area. Language Arts class links. Contains many interactive activities including Eduplace link. Science class link section. 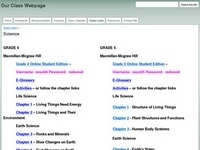 Notice the online textbook access and links to the textbook series. Resource area contains some information for both parents and students. Some more sets of links to learn about the flipped classroom. Videos to support learning. Organized in different ways. Sample unit listing for fourth grade math showing lessons supporting videos. Ways to contact me including phone number and email.